Brambleton is zoned for a full range of residential and commercial uses. The overall layout of Brambleton calls for over 8,000 residential units, including an active adult community; a Town Center with 300,000 square feet of retail space and 200,000 square feet. Brambleton was designed to incorporate traditional neighborhood features alongside pedestrian-oriented spaces and streetscapes. Amenities & Landmarks: Brambleton offers residents amenities that include, Special events throughout the year such as summer concerts in the Town Center, family camp-outs, fundraisers and many more, Sport & Health Club, Clubhouse for party rentals, Scenic parks, ponds and trails, Playgrounds, 2 pools, Soccer, football, softball and baseball fields, Tennis, basketball and volleyball courts, 4 schools, 3 day care centers and 3 worship sites planned, and the Brambleton Town Center with convenient shopping, services, entertainment and some of the best restaurants in Ashburn. The Town Center is the heart of Brambleton and serves as the location for the community’s annual Sizzlin’ Summer Concerts, Farmers Markets, July 4 fireworks display and numerous special events and festivals. Brambleton Golf Course is also a local favorite that attracts golfers, wildlife and rave reviews. In addition, the new Loudoun Station development is currently under construction. Situated just off the Dulles Greenway and at the terminus of the new Silver Line-Route 772 Station, Loudoun Station will offer an exciting mix of shops, restaurants, residences, and offices, along with a hotel and 11-screen movie theater. Economy: Loudoun’s population is the fastest growing of all counties in the United States, and Ashburn itself has over 50,000 citizens. Located within the Dulles Technology Corridor, Ashburn is home to many high-tech businesses. World Trade Center Dulles Airport is currently under construction, Verizon Business has a major office in Ashburn at the location replacing MCI WorldCom’s headquarters after its acquisition. Ashburn is also home to government contractor Telos and AOL maintains its Ashburn location as a satellite office. Airbus Group, Inc., a defense contractor headed by former NASA administrator Sean O’Keefe, has a second location in Ashburn in addition to the main office in Herndon, Virginia. Education: School age children who attend public schools are part of Loudoun County Public Schools. It is home to Legacy Elementary, Creighton Corners Elementary and Moorefield Station Elementary, Stone Hill Middle School, Briar Woods High School and Rock Ridge High School. Getting Around: Located on over 1,500 acres just 33 miles west of Washington, D.C., and only minutes away from Dulles International Airport. Brambleton is conveniently located just off the Dulles Greenway and minutes to Route 28, Route 50, Loudoun County Parkway, and Route 7. Ashburn will also be home to one stop on the new Silver Line Metro train system. Located between Ryan Road and Loudoun County Parkway off the Dulles Greenway, Silver Line Station Route 772 will provide a speedy commute through the Dulles Corridor to Washington Dulles International Airport, Reston, Tysons Corner, and downtown Washington, D.C.
History: Brambleton is located at the site of the former community of Royville, VA, which existed as early as 1908 at the intersection of Belmont Ridge Road and Creighton Road. 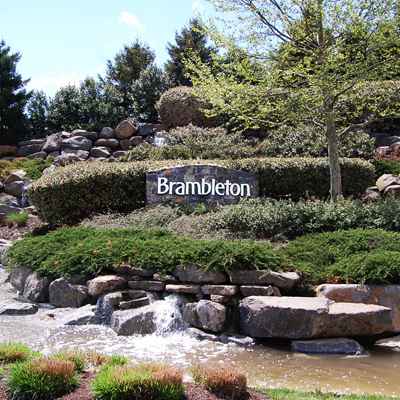 Developing the Brambleton master-planned community began in earnest in the spring of 1999, immediately after Brambleton Group L.L.C. acquired the property. Road improvements were necessary along Route 607/772 to connect Brambleton to Exit 7/Loudoun County Parkway off the Dulles Greenway. Today, Exit 7, the Loudoun County Parkway, is the gateway into the Brambleton community. Residents in the development are members of the Brambleton Community Association, a full service homeowner’s association.